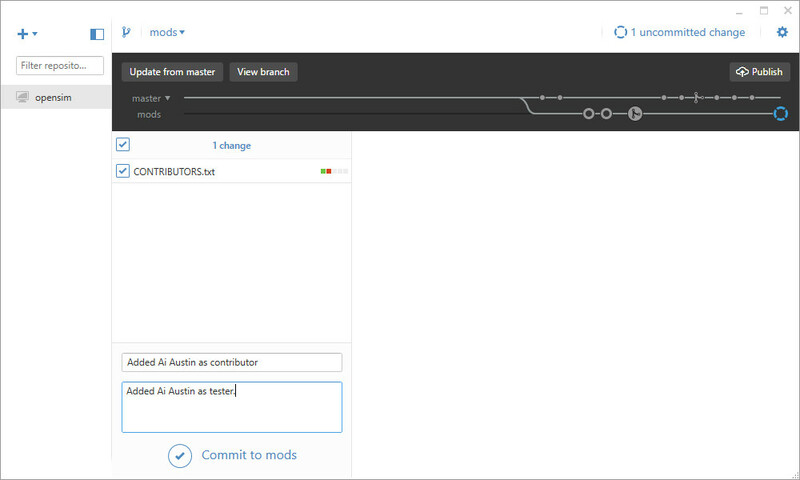 Git is a source code version control supporting contributions from a number of developers. Git tutorial and reference material is available via including a complete online “Pro Git” book. 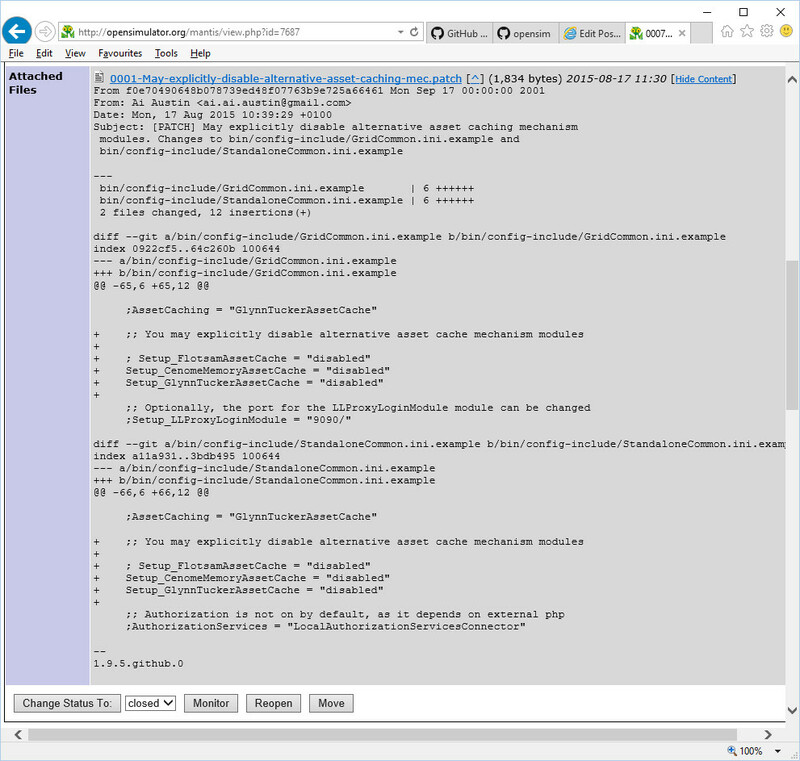 The notes here are the process I used, after a few experiments, to establish a simple Git environment and workflow on a Windows 10 desktop to allow me to create patches in the required form to potentially contribute to OpenSim. Create an account on GitHub.com if you don’t already have one. That will allow you to create a simple profile including the name, e-mail address and thumbnail image you want to use when making contributions to projects. Obtain and install GitHub Desktop (Windows or Mac) via https://desktop.github.com/. This creates two desktop icons, one for the GitHub GUI and one for a Git Shell (using Windows Power Shell) which work in harmony. If you have not already done so, launch the Git Shell and you can set the editor you wish to use to add messages into patches to one that can handle Unix line endings (which Windows Notepad does not). Note the editor executable must be on the Windows PATH. E.g. This also sets all the files as “tracked”. 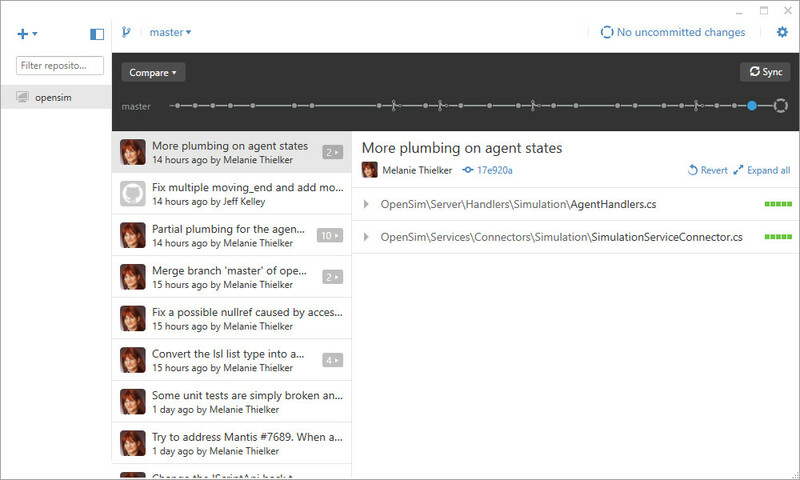 Changes to any of these files are monitored so they can be added to any commit. Newly added files though need to be explicitly handled (see later). Note that git://github.com/opensim at http://github.com/opensim is a mirror of the main repository at git://opensimulator.org/git/opensim but you should use the main repository as it will be up to date. With the default location for GitHub files of C:\Users\username\Documents\GitHub this will create a directory in C:\Users\username\Documents\GitHub which contains the OpenSim files and a special .git directory which supports all the Git operations, your commits and patch creation operations. 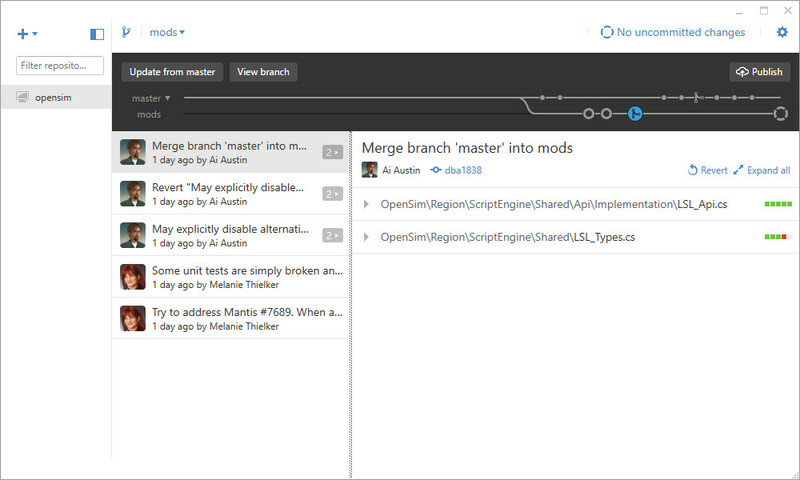 Note that this will also show the current branch you are set to (initially “[master]“). You can use also this Git command at any time when set to the “master” branch to “sync” the OpenSim Master Repository files with your local copy. Now you are all set to make changes, and to create patches from the changes you make. I found that the “GitHub” GUI tool was most useful from this point right up to the preparation of a patch, for which I swapped back to the Git Shell. Git settings and branch changes made in the Git Shell and GitHub Tool for any GitHub project are synchronised (the magic happens in the projects .git directory). 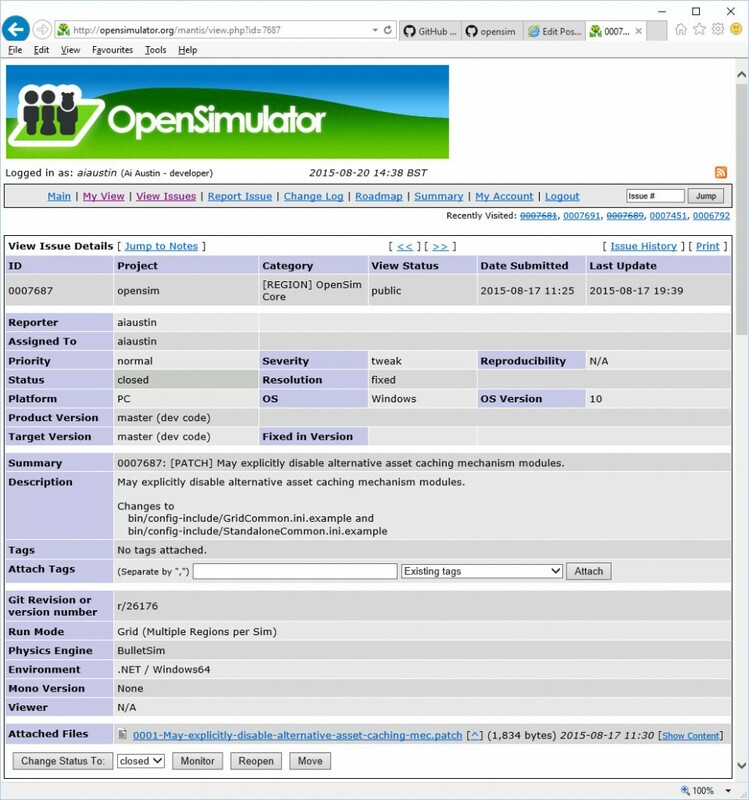 Select “opensim” Repository – When you run the GitHub tool you can choose one of the repository is you have set up… the opensim repository will show in the left column, if you have performed a “clone” operation. More can be added via the “+” icon in the top left corner. But for some reason “remote” does not allow for connections to repositories that are not hosted on GitHub.com itself. Select “master” branch and “Sync” – You can select the “master” branch in the branches drop down menu near the top left. A “Sync” button in the top right corner allows you to synchronise the OpenSim Master repository files with the local copy. The “Sync” on the “master” branch in the GitHub Tool is the same as using “git pull” on the masdter branch in Git Shell. Select “mods” branch and “Update from master” – Select the “mods” branch you made for your own changes and perform an “Update from master” to bring in any changes made recently to the “master” repository so they are available in the version you will change. 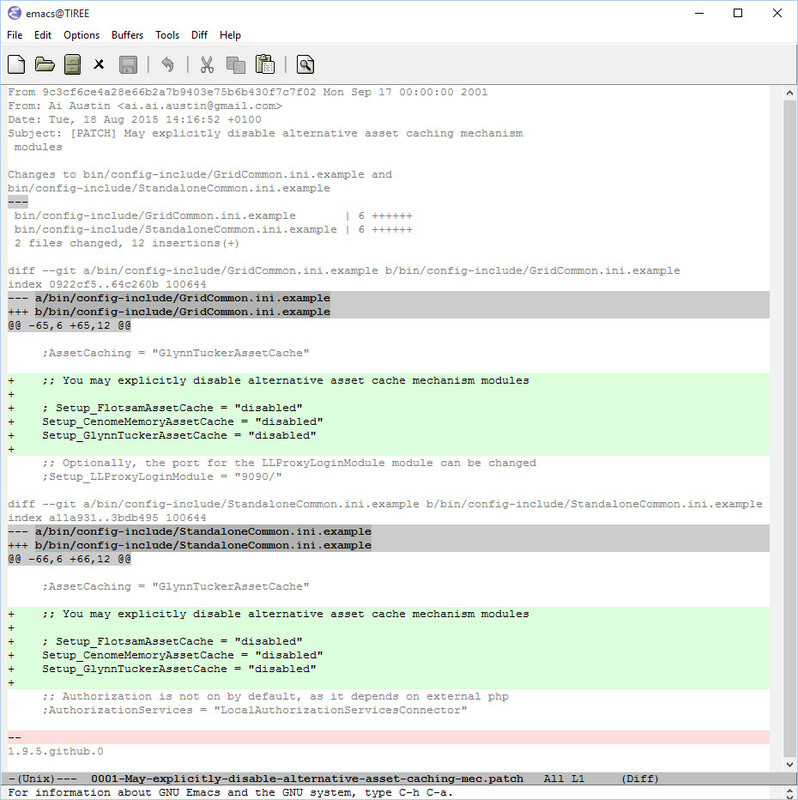 Check if there are uncommitted changes – On the “mods” branch you can see a button in the top right saying if there are “No uncommitted changes” unless you have made changes you have made to the “tracked” files that are not yet notified to Git via a commit. Commit N uncommitted changes(s) – When you do have changes and want to create a single commit for all the changes.. hit the button and a panel opens to allow you to insert a short “Summary” and a longer “Description” of the changes you have made. Note that using –stdout > patch.txt does not work for opensim use as the line endings are Windows form)..
Go to the OpenSimulator “Mantis” issue tracking web site at http://opensimulator.org/mantis and create an account there if you have not already done so, or login if you have. If your modifications relate to an existing Mantis issue add a comment and attach your patch file. If its a new issue create that and attach the patch file. In both cases amend the status to “patch attached” to draw the attention of the OpenSim core developers to your contribution. For a new issue, by convention, add the text [PATCH] to the front of the Mantis issue summary. After the issue has been created or modified, so a final check that the patch looks okay expand the patch to “Show Contents” and especially watching out for extra blank lines, indicating that Windows CR/LF extra symbols have wrongly been added. Then go back and cerate a new branch “£mods” and work afresh in that for the next patch you wish to contribute. Resetting local master copy to remote contents. Ensure you are set to the opensim “master” branch. This entry was posted in OpenSim and tagged Git, OpenSim. Bookmark the permalink.